Researchers have developed a humanoid robot prototype, HRP-5P, intended to autonomously perform heavy labor or work in hazardous environments. 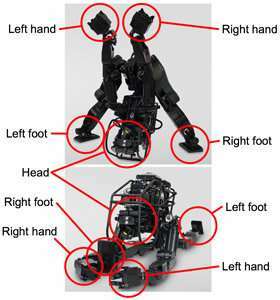 As a 182 cm, 101 kg humanoid robot, HRP-5P was built on HRP series technologies by incorporating new hardware technologies. Within the series, it has unsurpassed physical capabilities. Its robot intelligence comprises environmental measurement and object recognition, full-body motion planning and control, task description and execution management, and highly reliable systemization technologies. Housing the intelligence in this body has enabled autonomous gypsum board installation by the robot, which is a typical example of heavy labor at construction sites. The use of HRP-5P, as a development platform, in collaboration between industry and academia promises to accelerate R&D toward practical application of humanoid robots at building construction sites and in assembly of large structures such as aircraft and ships. The declining birthrate in Japan is expected to cause serious labor shortages in construction and many other industries. It is imperative to solve this issue using robot technologies. These technologies also provide a compelling alternative to having construction workers at building sites, aircraft facilities, or shipyards perform heavy labor that is potentially hazardous. However, it has been difficult to make these large-scale construction sites suitable for robots, which has discouraged introduction of robots. Because humanoid robots physically resemble people, they can work without requiring environmental changes, possibly relieving workers of heavy labor. In the development of the HRP series, AIST has collaborated with several private-sector companies, including Kawada Industries Inc. (now Kawada Robotics Corp.), and has developed basic technologies for practical application. HRP-2 was capable of bipedal walking, lying down, standing up, walking on narrow paths, and other actions. HRP-3 could walk on slippery surfaces and tighten bolts on bridges by remote control. 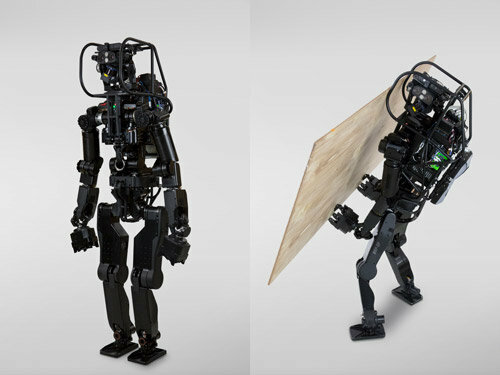 Disaster-response humanoid robot research underway at AIST since 2011 led to a revised version of HRP-2 with improved physical capabilities (such as limb length, range of motion, and joint output), which could walk on rough terrain, turn valves, and perform other tasks semi-autonomously based on 3-D environmental measurement. However, its physical capabilities were still insufficient for heavy labor such as gypsum board installation, and it lacked enough degree of freedom and sufficient movable range of joints to emulate human motion in complex environments. Toward this end, AIST pursued development of the humanoid robot, HRP-5P, with physical capabilities enabling it to substitute for people doing heavy labor. Furthermore, HRP-5P inherits the technologies of HRP series and utilizes patented technology of Honda Motor Co., Ltd.
A part of the development of HRP-5P was supported by R&D commissioned by the New Energy and Industrial Technology Development Organization (NEDO), "R&D on highly dependable humanoid robot systems that can work in unstructured environments" in "autonomous humanoid robots (innovative element robot technologies field)" of "R&D on next-generation core robot technologies," and grant-in-aid for scientific research from the Japan Society for the Promotion of Science, "Targeting full-body motion planning based on environmental model acquisition that enables humanoid robots to adapt to unknown environments" (research project number JP17H07391). The humanoid robot prototype HRP-5P was developed with a robust body and advanced intelligence to work autonomously and provide an alternative source of heavy labor. At a height of 182 cm and weight of 101 kg, HRP-5P has a body with a total of 37 degrees of freedom: two in its neck, three in its waist, eight in its arms, six in its legs, and two in its hands. Except for the hands, this represents the most freedom of movement in the HRP series to date. Compared to the revised version of HRP-2, adding one degree of freedom to the waist and one to the base of the arms has enabled operations more closely resembling human motion. Accordingly, using both arms, HRP-5P can handle large objects such as gypsum boards (1820 × 910 × 10 mm, approx. 11 kg) or plywood panels (1800 × 900 × 12 mm, approx. 13 kg). To emulate human motion by the robot without as many degrees of freedom as people, the researchers ensured a wider movable range of joints in the hip and waist areas, where multiple joints are concentrated. For example, hip joints that flex and extend the legs have a range of motion of 140° in humans and 202° in HRP-5P (Fig. 1), and waist joints that turn the upper body have a range of motion of 80° in humans and 300° in HRP-5P. 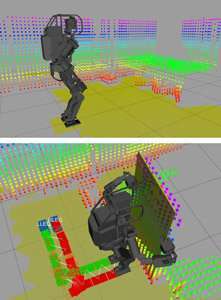 This enables work by the robot in a variety of postures, such as when deeply crouched with the upper body twisted. 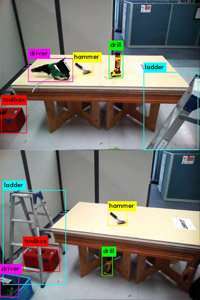 Using head-mounted sensors, the robot constantly acquires 3-D measurements of the surrounding environment (at a frequency of 0.3 Hz). Even if the field of view is blocked by objects used in work, stored and updated measurement results enable execution of the walking plan while carrying a panel or correction of walking when the feet slip. (Fig. 2). Learning involves a convolutional neural network using a newly constructed image database of work objects. The robot can detect ten types of 2-D object regions at a high precision of 90 % or more even against low-contrast backgrounds or under dim lighting (Fig. 3). It was possible to build a highly reliable robot system and maintain the quality of large-scale software (with approx. 250,000 lines of code) by arranging a virtual test environment for the robot intelligence in the Choreonoid robot simulator and monitoring software regression for 24 hours. Integration of these technologies has enabled autonomous gypsum board installation in which HRP-5P handles and carries large, heavy objects at a simulated residential construction site independently. Specifically, this work involves the following series of operations. Generate a 3-D map of the surrounding environment, detect objects, and approach the workbench. Lean against the workbench, slide one of the stacked gypsum boards to separate it, and then lift it. While recognizing the surrounding environment, carry the gypsum board to the wall. Lower the gypsum board and stand it against the wall. Using high-precision AR markers, recognize and pick up a tool. Holding a furring strip to keep HRP-5P itself steady, screw the gypsum board into the wall. R&D on robot intelligence will be promoted using this platform, targeting an alternative source of autonomous manual labor at residential or office building sites, and in assembly of large structures such as aircraft and ships. This will compensate for labor shortages, free people from heavy labor, and help them focus on more high-value-added work.